Well, we’re back. Things didn’t work out completely as planned as far as internet access and updates, but it was anticipated there would be little contact. And, it came to pass. According to one analysis site looking at world wide internet availability, Scotland is in the bottom 20% in the UK and Europe when it comes to availability and quality (speed, connectivity), and where the Isle of Skye is concerned, that applies to the east coast of the island. The west side is pretty much zilch. When I did have internet twice at campgrounds and once in a hotel lobby, the connection was too slow to transmit photos or update my newsletter. I used the internet to try to check email (sort of successful) and to locate my lost phone (successful – that’s a story all by itself). But, we’re back and after 4 days our bodies are again on Mountain Time. Even with some preparation, the 7-hour difference took some adjusting. I’ve started working on the over 130GB of photos and video and writing up some newsletters to send out to project supporters. The weather was about 75% rain and 85% overcast. According to local reports, this has been the rainiest (worst) summer in memory. The temperature also hovered in the 50s and 60s, which was a relief from our 100 degree heat here in Idaho. I didn’t mind the weather, was actually hoping for some overcast days, but would have appreciated more broken clouds for lighting variety on the landscape. When the sun did come through the clouds it was magical, and there were a couple days with long periods of partly sunny. We experienced three sunsets where the sky was visible and there was some color. The rest of the time it was a challenge with the overcast and rain. I think I got some great shots, but will need to spend some time looking at what I have (didn’t get much time to review images on the road) and begin processing photos for the book. I’ll post some online on my website and social media (Facebook, G+, 500px) as I get them finished. Why are we going to be driving around Scotland in a motorhome? Why not?, some would say. When I first started planning this trip, it was more “traditional”. You know, rental car, hotel/B&B, restaurants. But the more I looked at where I wanted to go, especially in some parts of Scotland, there wasn’t much nearby which meant long drives from bed to photo op. And back. That doesn’t leave much time for getting to know a place, except through the windshield and out the driver’s side window. I like to spend time at a location where I’m shooting. How else can that be done? Camping. Get right to the spot where you want to be, or very close, and you’ll be there when things happen, not “nearly there”. But camping can be problematic. There are the issues of equipment; tent, sleeping bag, stove, pots & pans, cooler(s) for food and drinks, electricity for operating laptops and battery chargers. Especially when traveling overseas. When traveling, where do you rent that stuff and is it available from one place or will I have to drive all over town after I arrive to collect it all? Will it be a mishmash of this and that, not fitting or working together (especially if it’s rented from different locations)? If it’s a backpacking trip, no worries, just carry it all on the plane with you. Or if you’re with others who love camping (real camping). And there’s the weather. A tent (or awning) would be great when the weather’s perfect but, even in mid-summer, the weather in Scotland can turn foul. Average high temperature in late July hovers between 65 and 70 degrees F, lows around 45 – 50, and can rain at any moment. I’ve car camped with a wet tent. Not fun. But, the logistics for carrying camping gear, or renting it from afar, and my photography equipment and other electronic needs, meant I couldn’t go bare bones for this adventure. So, I looked into renting a camper van. This seemed to be the most efficient way to go. One vehicle becomes both transportation and living quarters. The itinerary can be more flexible since we wouldn’t be locked into months(or weeks)-in-advance accommodation reservations and having to be somewhere at a certain time. We could stop just about anywhere, be there when the conditions were right, spending less time driving back and forth. In the U.S. we often use the terms RV and motorhome. RV can refer to a variety of recreational vehicles including trailers (pop-ups and fifth-wheels), a camper shell in the bed of a pickup truck, or any of the self-enclosed, powered, “motor homes” seen on the road from the 2-person VW bus to a family-sized converted charter bus (I call them land yachts). At least in my recent experience, in the U.S., “RV” tends to refer to the smaller to mid-sized recreational vehicles and “motorhome” is reserved for the larger, converted passenger bus style mobile home. When I was in New Zealand at school, a camper van was a small, two-person RV with a bed, sink, stove, maybe a shower but at least a toilet. My research into camper vans led me to minivans with a mattress in the back and an awning. Maybe a small one or two-burner stove and 1 cubic foot sized refrigerator. Actual car camping. No shower, no toilet. No auxiliary outlets. No space. Very reasonable price, though. Widening my search I discovered that motorhomes in Britain and Europe are more of the type of camper van I originally intended to use. Of course, a motorhome is about twice to three times the cost of the minivan with the awning, but it includes a nice sleeping area, storage, a table for eating and working, a kitchen, shower, and toilet. Nearly completely independent travel. While the rental price was about twice the minivan, it was still less than the cost of hotel/B&B plus restaurant meals plus rental car plus fuel. And the rental included unlimited mileage! And, even if it was the same or more, the convenience and flexibility is so much more appealing. Also, many of the places I want to visit and photograph are far away from amenities like food and water. being able to carry a good supply on board will also reduce travel time and fuel costs. In Scotland, the Land Reform Act (2003) allows a person to camp on private land, if not signed against it. It’s called “wild camping”. A backpacker can camp in a farmer’s paddock and generally not be hassled by the landowner if the camper is respectful and doesn’t litter, interfere with land use, cause damage or a ruckus. The term and privilege doesn’t exactly apply to recreational vehicles on private land, but pullouts and side roads away from traffic can be used to park overnight. Scotland is one of the few places in the U.K. where wild camping is allowed. Well, I thought, RV’ing is a great way to travel. I had a workshop scheduled in Oregon and figured I’d rent a motorhome/RV for that. Maybe even plan a motorhome-centric traveling workshop somewhere. But, when I looked into renting a small motorhome here in Idaho, I couldn’t find one. They were all the big, family-sized 25 and 30-foot+ buses. I don’t need a camper that sleeps 10, has slide-outs, satellite TV and a big screen, and the price was way more than I wanted to spend for a weekend or a week. That alone wasn’t economical for me, but the real kicker was the mileage. I did find a company that had a smaller RV that slept 6, but they all rent with a 100 mile per day limit. No unlimited mileage. If you drive over the allowed miles/day, the charge ranges from $0.35 – $0.70 per mile. That can add up very fast, especially if you’re driving around the western U.S. 300 miles per day isn’t unheard of between locations, and could be considered an average daily drive. The 100 miles/day set up is primarily geared toward destination renting – driving a couple hundred miles to the shore of a lake or river and parking for the duration. This is different than motorhome travel in the U.K. and Europe which tends to be more “linear” than “punctuated”. It’s still a popular way to vacation in the U.S., though. Motorhomes book up early despite the expense and limitations. Perhaps with more in-depth research I can find where there are better RV rental opportunities. In southwest Idaho, though, the options are rather small. I do have a photo workshop planned for Iceland in October, 2016, which will be uniquely motorhome-based. I’m really looking forward to that. I’ve been shooting digital since 2001 but I still enjoy the analog processes of photography. Digital is still too far removed from the hands-on creating I enjoyed in the darkroom. Up until 2009, I also used Polaroid film to make transfers and to hand manipulate (SX-70 film). In 2009, Polaroid stopped making that film. Later, I turned to one of the first photographic processes, cyanotype. Developed by Sir John Herschel in 1842, the cyanotype is the basis for the modern blueprint process and was used to illustrate the first book to use photographs in 1843 (by Anna Atkins, considered to be the first woman photographer). The process is rather simple, requiring only 2 chemicals for the light sensitive emulsion and water for developing the image. Cyanotypes can easily be made at home without the need of a darkroom and expensive equipment. While I was making some prints the other day I thought it would be great fun to make cyanotypes in the field while I was in Scotland. So, that’s what I’m going to do. But, I will be making a version of the cyanotype called a photogram. To give a short overview of the process, the sensitized emulsion is applied to a substrate (watercolor paper). To make a photograph, a negative, either film or a digital negative made using transparency film and a printer, is placed on the paper (to create a contact print – the negative is in contact with the paper and the image made is the same size as it is on the negative), and exposed to the sun. When the exposure is complete (about 4 – 6 minutes), the paper is washed in a water bath which sets the image. The final image oxidizes in the air and becomes a dark blue (the “cyan” in cyanotype) where the sun directly exposed the paper, white where the light was blocked from the paper, and various shades of blue where the sunlight was partially blocked from the paper. A photogram does not use a negative, but works with objects, like grass, rocks, twigs, feathers, etc., placed directly on the sensitized paper. The resulting image is a higher-contrast image mostly of either blue or white. If there are translucent objects, like a feather, there can be shades of blue. Initially, I was going to bring along the dry chemicals and mix and apply everything in the field. But after considering equipment needs I decided to just take along some pre-sensitized paper. I have some commercially produced paper that is sensitized across the whole area of the paper and I’ll make some sensitized paper here to take along. I’m also going to try a cross between the negative and photogram aspects of the cyanotype. I will bring along some clear film sheets (transparency film) and, using sharpies, draw a scene on the film and print it on the paper like a negative; “plein aire cyanotype”. That will be interesting, I’m sure. Today, I’m getting my international driver’s permit. You don’t need one for Scotland, actually, it’s primarily for non-English speaking countries, but I was encouraged by the guy I’m renting the motorhome from to get one because he was changing his insurance carrier and wasn’t sure if they’d require it or not. It won’t hurt anything to have it. That means getting a couple passport size photos made and turning in an application to AAA. I’ll receive a booklet written in several languages that essentially says I have a driver’s license. It’s only $15 plus $8 for the photos and it’s all done at the AAA office. The next few posts before I take off will be about the route I’m considering and the locations I’ll be visiting. Stay tuned. The concept of ecology has no definite starting point but was implied by Herodotus, Plato, and Aristotle at least as far back as 2400 years ago in discussions about the population fluctuations of insects and mice. As I’ll describe later, I think the concept goes farther back and is not a concept isolated to the Greek philosophers. Henry David Thoreau used the word ecology in some of his letters in 1858, but didn’t define what he meant by using it. The term wasn’t actually defined until 1869 when German zoologist Ernst Haeckel broadly described ecology as the total relationship of animals to both the organic and inorganic environment. It wasn’t until 1961 when Australian research scientist Herbert Andrewartha provided a more restrictive definition of “the scientific study of the distribution and abundance of organisms”. Haeckel’s definition was broad enough that there was very little in the world that was not ecology, encompassing physiology, behavior, genetics, as well as evolution. It turns out that, today, Haeckel was generally correct. The concept of ecology, the interrelatedness of things, encompasses a very large part of life on Earth. Contemporary ecology illustrates that as a patchwork of many sub-disciplines such as population ecology, community ecology, conservation ecology, ecosystem ecology, spatial ecology, physiological ecology, behavioral ecology, evolutionary ecology, and more. What does ecology have to do with art, or our senses and perception? Please read on. Indigenous cultures around the world from the Americas and China to Australia and India have been intimately familiar with the concept of interconnectedness throughout their long and ancient history. For indigenous cultures, this concept is represented by the circle and circular movements (the seasons and passage of time, lifecycles, and the relationships between generations, past, present, and future, e.g. Samsara in Hinduism and Buddhism and Kuleana in Polynesia). The Lakota (Sioux) have a prayer, Mitakuye Oyasin, which gives thanks to the Creator for the gift of life, to the minerals (land) for strong bones and all foundations of life experience, to the plants and animals for healing herbs, food, and companionship, to humans who share the path through the wheel of Earthly life, to the guiding Spirits, and to the Four Winds of Change and Growth. Mitakuye Oyasin is translated to mean “All my relations” or “We are all related” and the prayer concludes with “You are all my relations, my relatives, without whom I would not live. We are in the circle of life together, co-existing, co-dependent, co-creating our destiny. One, not more important than the other. One nation evolving from the other and yet each dependent upon the one above and the one below. All of us a part of the Great Mystery.Thank you for this Life”. I was first introduced to this holistic concept as an undergraduate working toward a wildlife biology degree. My ecology professor and undergraduate advisor, Dr. Bill Alldredge described ecology as “The study of reasons why” because, ultimately, every question posed in ecological study of where an organism exists, how many there are, how they got there, how they are adapted to conditions they live in, the interaction with their own species, other species, and the land, etc., always ends or begins with a question of why. The simplicity of it made sense. We’ve classified and identified groupings or “zones” in our environment on the landscape and species level that allow us to impart a sense of order to our world; to simplify as much as possible the complexity around us. But habitats, biomes, ecozones, trophic levels, and even individual plants, animals, and humans are not discrete entities. There are transition zones everywhere, regions of blending, connectivity, and communication between where one thing ends and another begins. Nearly everything we perceive in our environment, everything we see, feel, taste, smell, and hear, are products of vibrations; the vibration of air, light, muscle fibers, and ultimately molecules and atoms. Our sensory system has developed so each sense is receptive to a select range of vibrations. Our physical body is like an antenna, constantly receiving, collecting, transmitting and translating information from the environment. Our senses tell us where we are in the world, gives us our relationship to things, to ourselves, and to each other. The primary function of our senses is to give us the ability to find food, shelter, mates, and help us to avoid injury and death. Only the senses of taste and smell are connected when it comes to receiving environmental information. The others receive discreet signals; most people can’t hear the color red, taste the song playing on the radio, see the flavor of chocolate, smell the words of a poem, or feel the texture of a sunrise. A small portion of the human population does have interconnected senses through a neurological phenomenon called synesthesia, in which the stimulation of one sense triggers a response in another. Synesthetes, people who experience this phenomenon, for example, may associate letters or numbers with colors, odors, emotions, or sounds. However, all our senses are interdependent, receiving discreet information yet working together to help build our mental picture of the external world. A sensation is a process by which specific information from the environment is received by specific receptor cells of a sensory organ; the vibration of the air moving hair cells in the cochlea of the inner ear, photons striking the rods and cones of the eye, molecules docking with taste buds on the tongue and cells of the inner nose, pressure, temperature, and vibration of the skin, fluid flux in the semicircular canals of the inner ear, and others. Tactile (somatosensory, touch). Touch is a complex sense. Researchers divide the sense of touch into various processes: mechanoreception (pressure, movement), thermoception (temperature), proprioception (the sense of the position of parts of the body relative to one another, also referred to as kinesthetics), nociception (pain), and equilibrioception (balance). The body’s sensory apparatus is composed of two aspects, internal sensing (interoception) and external sensing (exteroception). Interoception is the visceral sense, the sensing of stimuli occurring inside the body, monitoring involuntary properties of homeostasis (the general operations of the body) such as blood pressure, blood chemistry, digestion, heart rate, respiration, body core temperature, etc., physiological properties like thirst, hunger, and tiredness, as well as emotions, mood, and sense of well being. Proprioception is an aspect of interoception. Exteroception is the sensing of stimuli affecting the body from the environment, using the five senses. Some studies have shown that external stimuli can affect the physiological and behavioral (internal) regulation of the body. From our senses we perceive the world around us. Perception is the organization, identification, comprehension (cognition), and interpretation of sensory information in order to represent and understand the environment, to create a mental image or map of the external world. Perception operates in two ways, top down and bottom up. Top down perception happens when we start our comprehension within the brain, such as replaying a dream, favorite song, or memory in your head. Bottom up perception is what occurs with sensory reception and the external and internal information that is sent to the brain for analysis, interpretation, and comprehension. Both top down and bottom up perception can use stored memory, knowledge, and experience to identify objects and events in general (something is moving through the air) or more specifically (a Boeing 787 jet airplane operated by Quantas has just taken off and is flying west at around 2000 ft. altitude). Perception is both a biochemical and neurological process and is a behavior, not a sense. Psychologist Hermann von Helmholtz (1821 – 1894) said that perception uses “unconscious inference” based on our current knowledge and experience with the world and, as such, our perceptions always conform to our presumptions about the world based on that knowledge and experience. We will always distort our conscious picture of reality to fit these presumptions. Our presumptions are affected by our personal history and cultural influences. Individuals with different personal histories can have very different perceptions when exposed to the same stimulus and cultural influences affect the perceptions of groups as well as individuals. Since perception is a behavior, it also has limitations (cognitive bias). So, our interpretation of the world will sometimes be incorrect (think of optical illusions, dreams, hallucinations, misidentifying sounds and textures, misunderstanding information [i.e. the “instant news” of the internet]). A percept is the object of perception, the thing being perceived, i.e. a glass filled with water, where the glass and the water each are percepts as well as the glass and water together, the same as a symphony as a whole is a percept and the sound of each instrument and groups of instruments, even individual musical notes, are percepts. Our senses inform our perceptions and our perceptions define our picture of the world and who we are as individuals. Our perceptions also influence the kind of art we make, the subjects and subject matter we prefer, and the materials and media we use to express ourselves. So, back to the concept of ecology. The study of our senses and perception is not that different from that of ecology. Aristotle and Plato also had their fingers in that pie and humans have been fascinated with how we are able to make sense of the world probably for far longer than that. Yet, after all this time we still only have a small understanding of how it all works. The senses and perception research field is also a patchwork of sub-disciplines and intra-disciplines including neuroscience, neurobiology, cognitive neuroscience, physiology, psychology, genetics, molecular biology, chemical ecology, gestalt psychology, biological psychology, cognitive psychology, psychophysics, philosophy, behavior, behavioral biology, behavioral psychology, engineering, physiological psychology, and others. It is the complexity and interconnectedness of our senses and perception that leads to such a wide range of separate and related study areas. Our senses interact and interconnect together. They connect us to the world and influence our perception of that world in which we as individuals, groups, societies and cultures interact in a variety of ways. Our senses are dynamic, continuously receiving and processing information not just from direct experience with our immediate surroundings as our ancestors did hundreds and thousands of years ago, but from a multitude of direct and indirect, active and passive sources in our own neighborhood and from across the globe through our own travel and research, television, the internet, communication with friends, family, people who we respect, and acquaintances. Our picture of the world is constantly changing (or being reinforced) based on the information received by our senses and processed through our perception, whether we are aware of it or not. Our senses and our mind form the transition zone between us and our environment. We are informed by external and internal events and information. Our lives are affected by events happening around us. We, like John Muir and Aldo Leopold, Plato and Aristotle, are connected to everything else. My interest over the past several years is why. Why has the human species co-opted its senses for a purpose (art and appreciation of art) not related to finding food, shelter, mates, or avoiding danger? How do our senses and perceptions influence our art making, and how do they influence who we are as individuals (which affects the art we create)? Discussions of art making are often, especially these days, about the how, how to make this or that, how to operate this gadget or that software, about the mechanics of art, not about the deep-down foundations we build our art on, not where the art actually comes from. A goal of the artist is to engage all the senses, to make a practice of continuous practice of observation of self and the environment, where you are and how you are “being” in the moment. This is sometimes referred to as mindfulness, but it is simply a practiced awareness of the information being received from the environment as well as internally, and the interpretations and understanding of that information so it can be used to our creative advantage. If we discover this for ourselves, I’m certain our art will change. For the better. Just about anything that engages us in a challenging way that requires appropriate skills to accomplish and the needed skills challenge our capabilities (though not frustratingly difficult) will give us enjoyment. If you’re debating with someone and your knowledge and skill is about the same as your ‘opponent’, the activity is more enjoyable than if you are more knowledgeable or they are. When you’re learning to play the piano, starting out with a Mozart piano concerto will only lead to frustration. How you approach engaging in an activity, of learning, depends on your motivation, internal and external. Pressure from yourself and others can strengthen or weaken motivation. There is a saying that goes a bit like this: If you want to learn something, teach it. Or maybe learn it like you’re going to teach it. It’s easy to let up on yourself if you’re learning just for your own enjoyment, to skip over the hard parts (yeah, I get the gist of it. If I need to I’ll come back and read it again). But, if you have to teach someone else, the responsibility, the challenge, of knowing, is greater. To have a sense of accomplishment and grow in your knowledge and skill, you need to be challenged, to push your capabilities into the realm of something new. Competition can be challenging and stimulating when it’s used as a means to increase knowledge and skill. A true competition is a two-way street, a kind of sharing; both sides, winner and loser, coming away from the encounter with new knowledge or skills. When it’s simply an end in itself, when the goal is just to beat your opponent (often done by a more skilled individual dominating over a less skilled opponent), the enjoyment is hollow, the win meaningless, and competition in that way ceases to be fun. The activity or challenge doesn’t have to me monumental. You don’t need to climb a rock face, run a marathon, or join a roller derby league. Everyday activities like mowing the lawn, grocery shopping, reading a book, waiting for new tires to be put on your car, or washing the dishes can be made more interesting by paying more attention to what you’re doing, maybe inventing a game to go along with the activity or analyzing all the actions and steps that are involved. The activity doesn’t have to involve physical exertion, it can be a complex mental activity. But these games and activities must be challenging and somewhat complex. It’s easy to make up simple tasks to relieve boredom, but after a while even those games become boring and you’re just filling in time. Enjoyment lies in the boundary zone between boredom and anxiety, between where things are too easy and where things are too difficult. It’s when all your relevant skills are needed to meet the challenge of the task, when your attention is fully focused on achieving a goal, when your brain is using all its energy to process the information needed to meet that challenge. At that point, there’s no energy left over to spend thinking about anything else. You become completely absorbed in what you’re doing. When you think of Scotland, dinosaurs are probably the last thing to come up (except for Nessie, of course). But, did you know the Isle of Skye is one of the few places in the world where evidence and fossils of rarely preserved Middle Jurassic dinosaurs can be found? The Middle Jurassic is the second epoch of the Jurassic Period, between about 176 to 161 million years ago. 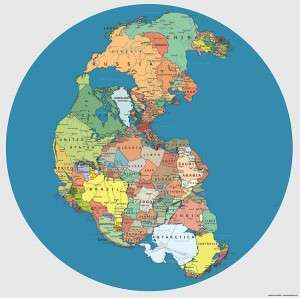 In the Middle Jurassic, the continents of Earth were still mashed together in the supercontinent called Pangea. The representative figure here shows Pangea with the associated modern country boundaries referencing the relationships of current land masses to the continental drift that occurred once Pangea began to break up after the Middle Jurassic. With all the continents basically part of the same land mass, it’s easy to imagine how dinosaurs and other creatures could distribute themselves “around the globe” before becoming isolated over time by increasing widths of water bodies like the widening Pacific and Atlantic Oceans. On the Isle of Skye, footprints and bones of large herbivorous Sauropods and Ornithopods, carnivorous Megalosaurus, and omnivorous Cetiosaurus and Stegosaurus, bivalves and ammonites, fossil trees and trilobites have been found. In 1959, an amateur fossil hunter discovered some bones on the coast north of Portree and in January, 2015, donated them to the Edinburgh School of Geosciences. The fossil was found to be a new genus and species of Ichthyosaur (Dearcmhara shawcrossi, a 4-meter long dolphin-like predator), the first found in Scotland. The Isle of Skye is home to the discovery of the earliest Ankylosaur-like dinosaur (a 4-legged, armored dinosaur with a clubbed tail), the earliest Coelophysid (a small, 2-legged carnivorous Theropod and ancestor of birds), the first evidence that Theropods formed family groups, and the world’s smallest dinosaur footprint. All of Scotland’s dinosaur evidence as well as those of ocean-living reptiles comes from the Isle of Skye. Some of the locations I will be visiting, like Staffin and Elgol, are popular places to find fossils. I will be exploring those areas with my camera and hope to bring back some interesting fossil evidence for you to see. The next step is to begin narrowing down the route and locations for the trip. We’ll arrive in Edinburgh, but not spend any time there. We’ll be picked up at the airport and taken 40 miles north to Perth where we’ll pick up our motorhome. After we’ve become familiar with our motorhome, we’ll begin our journey northwest toward the Isle of Skye, with a bypass to Applecross, either stopping somewhere in between or driving straight through to Applecross and the historic drover’s pass Bealach na Bà (pass of the cattle). This road is known for its winding, twisting route through block cut mountains, it is one of the highest and most dramatic drives in the UK. We’ll spend the night in Applecross or on the pass itself and the next day reverse course to the Kyle of Lochalsh. Here is where we’ll find Eilean Donan Castle, one of the most photographed castles in Scotland. After that, it’s over the Skye Bridge and Loch Alsh to the Isle of Skye. 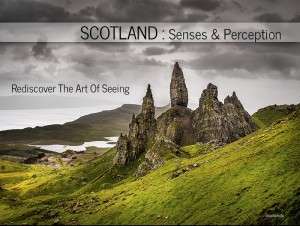 On the Isle of Skye we’ll make a counter-clockwise circuit from east to west, including the Isle of Raasay. There are many interesting locations to choose from, but to maintain a quality trip and experience, we’ll have to limit our exploration somewhat. Where we’ll definitely spend time are the Quiraing, Neist Point, Elgol, Glen Brittle, Talisker Bay, Loch Sligachan, and other back road areas. Leaving Skye via the ferry at Mallaig on the south end of the island we’ll return to the “mainland”, and pass by the Glenfinnan Viaduct (seen in Harry Potter) on our way to Oban. From Oban we continue to venture east into Glen Coe, Rannoch Moor and the iconic Buachaille Etive Mòr. we’ll stop by some castles; Stalker, Kilchurn, Inveraray (seen in Downton Abbey). We’ll return our motorhome to Perth and catch a ride back down to Edinburgh for our flight home. It will be an exciting trip full of discovery and I’m sure we’ll wish we had more days to explore. The work on the text portion of the book is ongoing. I recently discovered another reference book (Handbook of Psychology Vol 4: Biological Psychology) which has added some very useful non-clinical information on sensory processing. The most difficult part of my research over the years has been finding information on the senses other than vision; especially information related to the processing and cognition of sensory information rather than causes and treatments of sensory ailments. The primary sense used by humans is vision, with hearing a very close second,and the associated research follows that ranking. Touch is a somewhat distant third followed by taste and smell, each about equally lacking in perceptual research. As I’ve said, photography is more than just vision and I hope to prove that to you and reveal some very interesting things you’ve likely not thought of or considered when photographing or making art (since the concepts of this book are applicable to all art, not just photography). I’m also pursuing a couple grants for more funding which will allow me to increase the number of pages for the book from 80 to 120 + pages, to possibly increase the size of the book from 8×10 to a larger footprint (11.25 x 8.75), and make up to 20 prints for a spring 2016 exhibit. 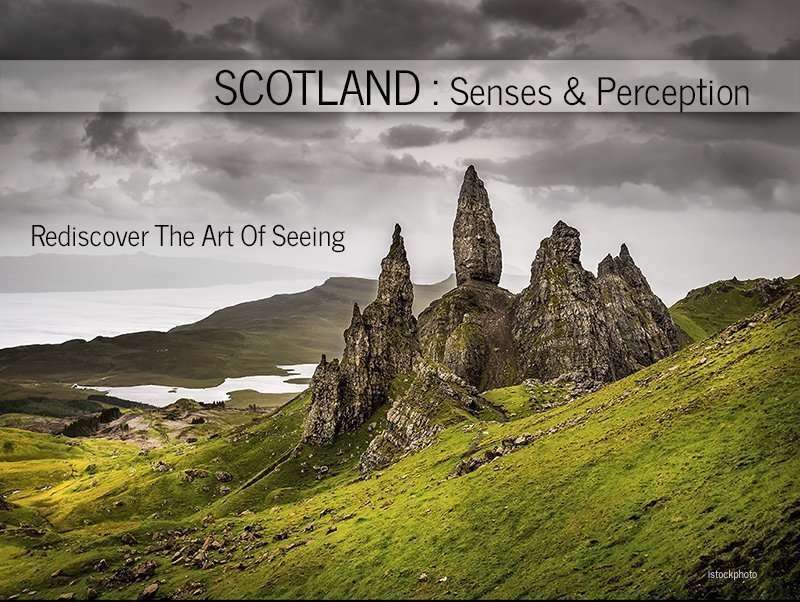 Welcome to the Scotland : Senses & Perception project blog page! Here you’ll find information and insights into the ongoing progress of the project during the funding phase (via Kickstarter and Indiegogo) through to the creation and distribution of rewards. Feel free to comment and ask questions. I’m looking forward to this journey and I hope you enjoy it, too. The funding portion of this project is pretty much over with. A huge thank you to the supporters who contributed to the project and also to the supporters who weren’t able to contribute but posted the project to social media and told friends about it. I appreciate your support. If you weren’t able to contribute or missed the funding deadline, I will continue to accept funding support for this project via PayPal. If you would like to contribute any amount or choose a support level (see below), you can contribute directly on PayPal. My account name is man@blueplanetphoto.com. Please make sure you include the support level you would like or indicate if you don’t want any perk items, and include your mailing address to receive books or prints. I will also put a button on my blog and website. I will be posting to this page from now until the end of the year with updates on the progress of the project. I intend on once-a-week updates, but initially there might be a longer gap, then posts as often as I have internet connection while in Scotland, then weekly updates again once I return until the rewards are completed. Bookmark this link or add it to your RSS feed to keep track of updates.